Getting it apart is the hard part, but here is a pic of the parts. 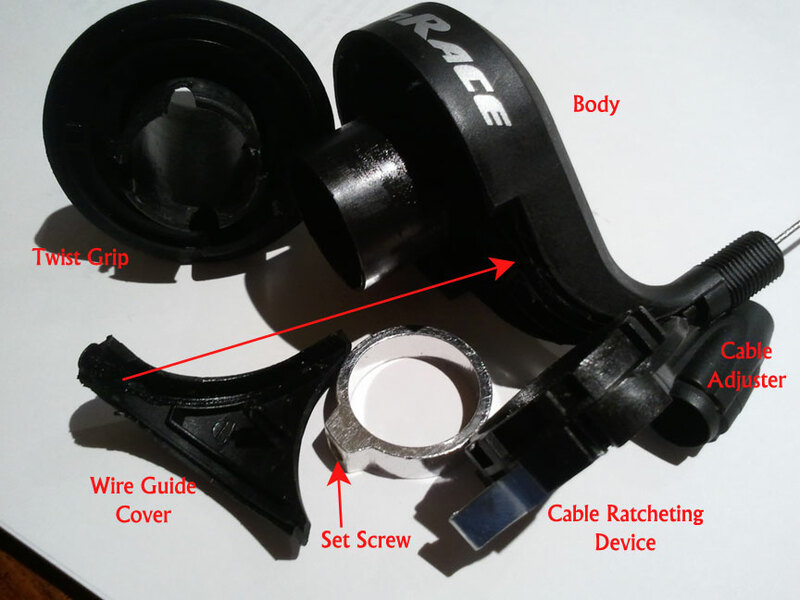 There is the body which has cable guide, a cover for the cable guide, the Twist Grip which has lips on it which hold the whole assembly together, the ratcheting device with a spring clip which indexes the shifter on bumps in the body and a metal ring with a set screw which holds the shifter on the handlebar. Step on to getting it off is to remove the grip. Then find the set screw hole and unscrew it enough to allow the shifter to slide off. 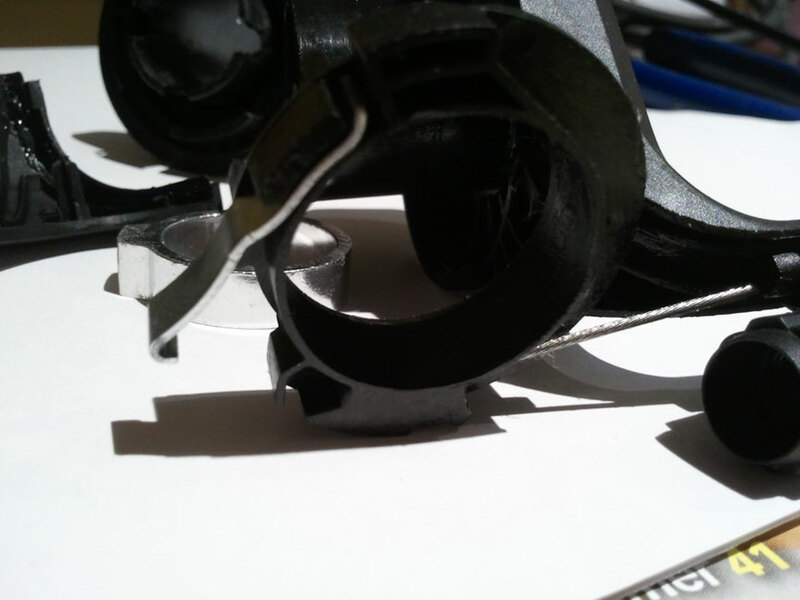 Now you can remove the metal ring with the set screw and here comes the tricky part. You need to shim the edges of the cylinder so you can slide the twist grip off the body. I used some jewelers screwdrivers and toothpicks. It will takes some time, but once it is shimmed it can be disassembled. The arrows are tying to show the lips on the twist shifter grip which hold the shifter together. These need to be shimmed to get the whole thing apart. 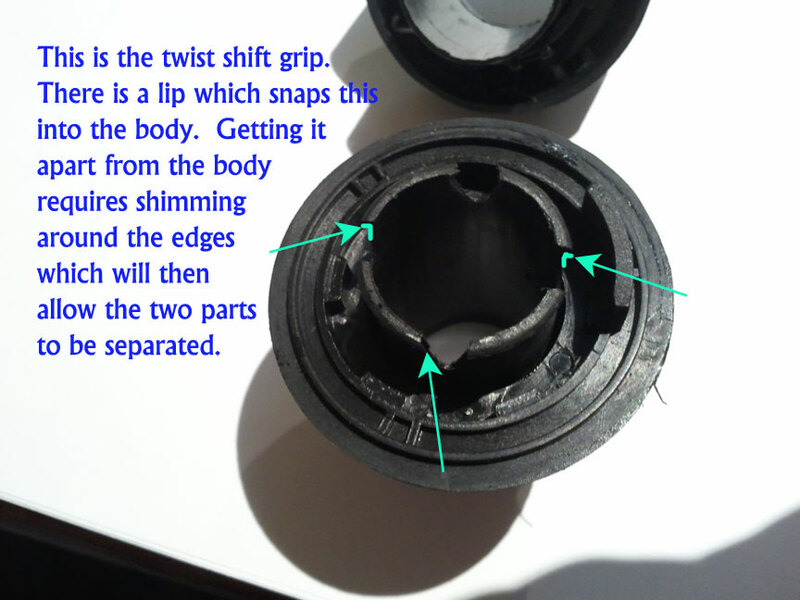 This is the part which is between the body and the twist grip. I am calling it the ratcheting device since it is what indexes the gears when the twist grip is rotated. It is also where the cable attaches and includes a spring clip which sets in a slot. The orientation of the spring is important since it will only work one way - and the spring will probably pop out when you get it apart. Body with the bumps for the gear indexer. 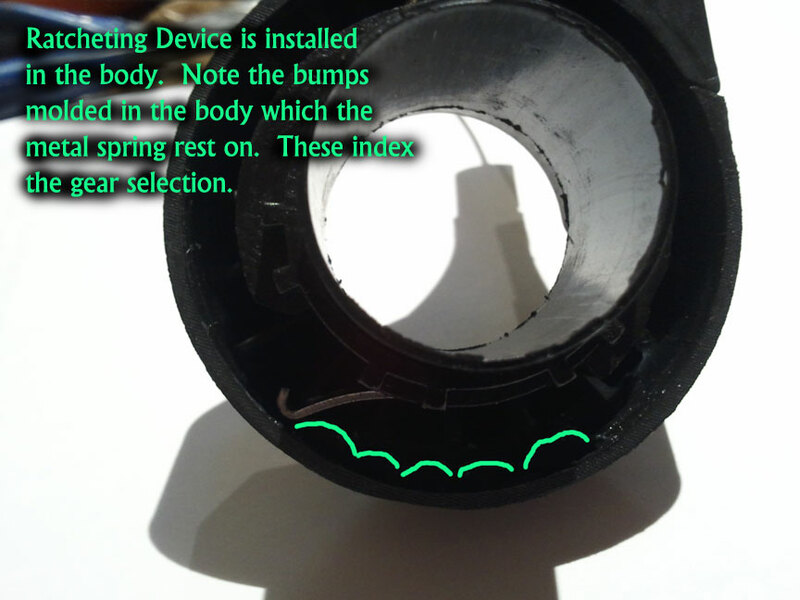 This pic shows the body and I have highlighted the bumps where the indexer will set each gear when the twist shift is rotated. The ratcheting device (above) is installed in this pic. The ratcheting device will slot into the twist shifter making them move together once it is re-assembled. After "fixing" this SunRace shifter I decided to replace it since it still shifts very hard. I picked up a SRAM MRX twist shifter which is almost a direct replacement for this one and may also be garbage but time will tell. The SRAM seems to be a very similar design even using the same style of ring to mount the shifter. Like the SunRace the SRAM MRX does not appear to be serviceable if the cable should need to be swapped out, and it appears to be similarly designed so I expect if I ever need to take it apart it will be a similar procedure. I posted an image link to the left for the SRAM MRX shifter I purchased on Amazon, I used the 6 speed version - you can select different speeds depending on what type you are replacing - in my case the bike was a Diamondback Tess. This is pretty much a direct replacement. So far it has been working, though you may want to go for a lever type shifter if you want something more robust.